NEWBURY, Vt. -- A macabre, decades-old secret hangs over this New England farm town hugging the Connecticut River. A retired judge thinks he has unlocked it. Prosperous but unpopular dairy farmer Orville Gibson disappeared in the wee hours of New Year's Eve 1957. Searchers pulled his bound body from the river nearly three months later. The case remains officially unsolved, but it's been widely accepted for decades that a small mob of drunken townspeople incensed by rumors that Gibson had beaten his elderly hired man kidnapped him, tied him up and threw him in a car trunk, where he suffocated. They threw his body into the river. The crime was deemed a "lynching" by editorial writers from Boston to Washington to the civil rights-era South. (All the players in Vermont were white, but white supremacists in the South used the story to cry they were being unfairly singled out for the mob killings of black men.) The story spread across the globe, even earning a feature in Life magazine. "You can go anywhere, quite a ways off, and if you say you're from Newbury they'll bring it up," said Eleanor Placey, 72, who was related to Gibson by marriage. Two men later went on trial but were both acquitted. Judge Stephen Martin, who as a new lawyer in 1960 helped represent one of the accused, recently published a book in which he argues Orville Gibson killed himself, with some ingenuity and difficulty, in a largely successful attempt to get revenge on his neighbors by pinning the blame on them. In "Orville's Revenge: The Anatomy of a Suicide," Martin argues that Gibson, broken by the criminal charge he was facing in the hired man's beating and by the enmity he had created among his neighbors, staged evidence at his farm, walked over a bridge to New Hampshire, climbed out on a pier, tied himself up and rolled himself into the water. "He was very proud, quick to hold a grudge, and his whole life was crashing down upon him," Martin said in an interview. Martin has taken his conclusions to the Vermont attorney general's office, whose investigators plan to take another look. They could reclassify the case and remove it from the list of Vermont's unsolved homicides. Not everybody buys Martin's theory. "I don't know why a supposedly intelligent man like Judge Martin would say that," said Doris McClintock, 75, Gibson's niece, who still believes some of her neighbors know what happened to her uncle. McClintock and the Placeys offer-point-by-point rebuttals of why they believe Martin's book is inaccurate, getting basic facts wrong and ignoring others that don't fit his thesis. They speak of threats they believe were intended to keep people quiet, including one in which a note was stuck with a knife to a tree outside the home of a potential witness. CBS affiliate WCAX reported that Larry Washburn and Bill Graham, both state troopers in 1957, questioned dozens of Newbury residents. But everyone claimed they knew nothing. "A lot of secrecy. No one was talking," said Washburn. Martin's theory isn't entirely new, but the book lays it out in detail. The idea that Gibson could have tied himself up was brought up during the second trial, but investigators didn't accept it. Gibson, 47 when he died, came to Newbury with his family as a child. He purchased the farm out of foreclosure several years before his death. Over the years, he built it up to be one of the richest properties in the fertile land along the river. But he never fit in. He and his wife weren't part of the partying crowd. He drew resentment for being the early bird at the courthouse to purchase his property, beating more established townspeople who wanted it. And then came the last straw - the story about the beating of his hired man. Gibson was charged with a crime, though some argue the man's injuries were exaggerated by the town rumor mill. The day Gibson disappeared, he had planned to visit a lawyer. Eleanor Placey's husband, David, now 71, responded the day of the disappearance to a call from Gibson's wife when her husband didn't return from the morning milking. In the barn, he saw evidence of a crime, including depressions in a grain bag where he believed two men had sat, drag marks on the floor and a crushed milk pail. "It was pretty plain that something happened there; there was not a question in your mind," Placey said recently. Police dragged the river but found nothing until the end of March, when troopers discovered Gibson's body miles downstream. He was wearing his farm clothes, his ankles were bound and his hands were tied behind his knees. His body was in remarkable condition. The death certificate cites "suffocation (means unknown)." 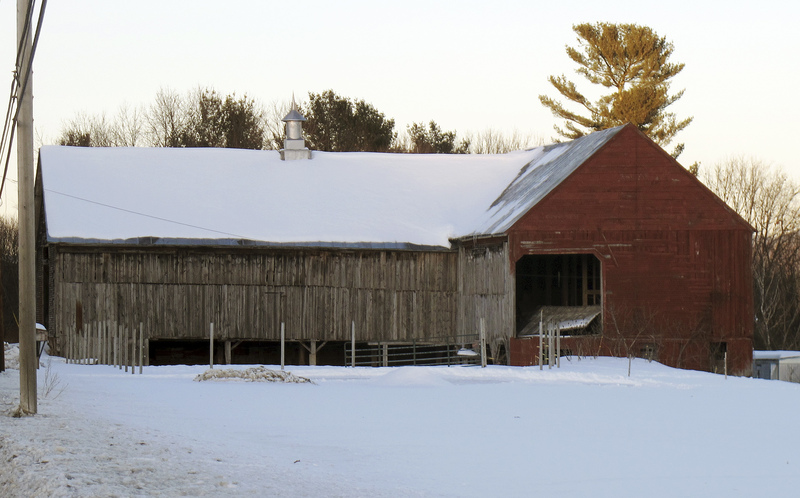 It wasn't until fall 1958 that a doctor told investigators he had driven by Gibson's barn the morning the farmer disappeared and saw a car he recognized and two men he knew. Those two men - Robert "Ozzie" Welch and Frank Carpenter - went on trial separately. Welch was acquitted after the judge ruled there wasn't enough evidence to convict him. A jury cleared Carpenter, represented with help from Martin. Martin, who became a judge in 1970 and retired in 1998, argues investigators never allowed themselves to consider possibilities other than a vigilante killing. He is seeking the support of the Vidocq Society, a private organization of sleuths that specializes in solving old crimes. Society member Peter Stephenson said he believes Martin's explanation. If vigilantes had killed Gibson, his body would have been beaten to a pulp. And by killing himself, Gibson was able to take control of a life that was spiraling down, he said. "If you look at Orville's behavior pre-crime, you'll find that a lot of people had tried to take control of his life," Stephenson said. By now, most of the original players are dead. Gibson's wife died in 1973. Welch died two months after the trial. Carpenter died in 1972. Despite the ugly memories it dredges up, Gibson's niece said she thinks it's good people are talking about her uncle again. "We would just like to know the answers," McClintock said. "I don't think there's any purpose of trying to arrest anyone. It's way past time for that."